1. 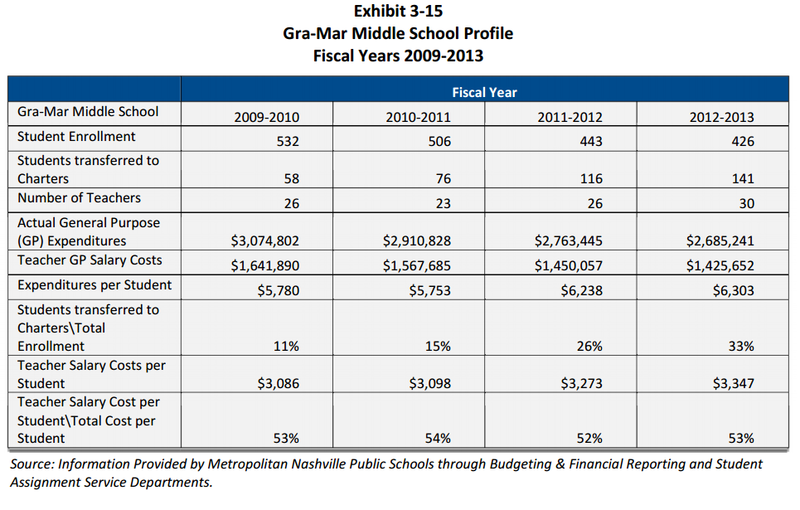 MNPS spends much more than the public thinks on a per pupil basis. If you look at the state report card or MNPS budgets, per pupil spending is often reported in the $10,000 to $11,500 range. 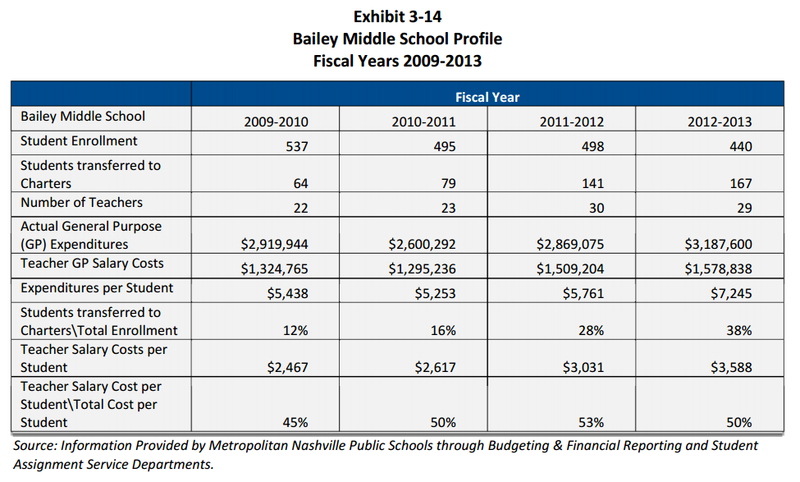 The MNPS accounting structure has a number of funds through which they spend money. The $14,747 represents spending from all those funds. I'm not 100% sure, but my initial read into the audit would reflect that this $14,747 per pupil does not reflect spending from private gifts or donations. MNPS receives many of these, both cash and in-kind from foundations and corporations in town every year. It also appears that the $14,747 does not reflect local school level support spending (like money raised through PTOs). In considering the amounts reported in the audit, spending which wasn't captured, and that Tennessee has a low cost of living structure, that's a lot being spent annually on a per pupil basis. Many in Nashville often comment that the main reason we have low school performance is an issue of being under-resourced financially. Is it really a question of not enough spending or of how we're spending the money throughout the district and across the city? 2. Money seems to be allocated according to equitable spending principles. It's reasonable to expect that more spending per pupil is needed for students classified as low income to be able to provide a rigorous education as compared to their more affluent peers (think of extra reading specialists, tutoring support, lower class size ratios for more personalized attention, etc). (This is somewhat in the eye of the beholder, as equitable for some may be the same per pupil spending amount for every student...but again, it seems reasonable that low-income, English Language Learner and Students with Disabilities need more resources on a per pupil basis to serve well). MNPS is spending money in a way that equitably makes sense. Yet other parts of the audit point out that MNPS is not often getting the desired academic results. Again, I believe this goes back to the question of how all dollars are allocated across the district by school type and program. 3. Charters are discussed (again). In addition, charters would not see that kind of enrollment increase if they were not in demand from parents. The numbers speak for themselves. If people preferred their local neighborhood zoned school, they wouldn't enroll in a charter. 4. "Cost issues" of charters may actually be mistaken for MNPS resource allocation inefficiencies. Charters are often blamed for costing the district too much or at some point in the future going to cost too much. It's sensible to be aware of charter school costs to be able to balance the overall MNPS budget, but there needs to be more context and nuance of the charter school discussion and the value they offer Nashville families and the city's taxpayer (higher academic return, lower cost). Let's all agree on something: charters cost money. So do all other types of schools and programs that MNPS manages. However, the cost structure of charters is actually the most efficient we have of any school type in the district. Charters only get paid if students attend. Put another way, charter school costs are perfectly variable. This is not the case for district schools. The district personnel staffing formula and costs of building maintenance and infrastructure still pay for many under-enrolled schools. These are not fixed costs as some would claim. These are variable costs too, which can be changed and modified. Given the district's staffing formula and the way it allocates funds for infrastructure and buildings, while it isn't as variable as charter costs are, these costs do have flexibility to be changed. Some could sit on their hands and say the costs are fixed...or we could look at ways to change how the staffing formula and infrastructure allocations work to be more efficient. These cost inefficiencies magnified over the scale of the district results in millions of dollars of inefficient costs. The audit did a close study of 5 district schools, looking at a partial cost impact of students transferring away from district schools to charter schools. The analysis did not consider all areas of cost savings, namely just teacher salary costs. If we ignore the student transfers to charter line (a partial reason of why students left this school), over the 4 years, 2009-10 to 2012-13, we see that Bailey's student enrollment went from 537 students to 440 students, yet added 7 teachers. Lose 97 students but add 7 teachers. Generally this is counter-intuitive. Bailey did get some extra turnaround money, but it is one time money, not year over year money to spend on things like keeping this number of teachers that is out of proportion to prior year teacher staffing ratios. As the bottom line shows, teacher salaries are 45-53% of the total cost per student. When a school loses students, especially of that magnitude, teacher reassignments to other schools in the district or reductions in staff are possible to ensure cost effectiveness. Gra-Mar's student enrollment went from 532 students to 426 students, yet added 4 teachers. Lose 106 students, add 4 teachers. Every school case has a unique context and specific set of factors to consider, including special turnaround or grant money. Generally speaking though, it'd be good to ensure that the MNPS staffing formula is appropriate for every school in the district, and is flexible and responsive enough year to year (and even mid year) to adjust staff and costs based on students leaving a district school (to go to a charter or other reason). The finger often gets pointed at charters for costs as being solely responsible for everything, but is the way MNPS allocates dollars for staffing and infrastructure as efficient as it can be? 420 at CPAC and the debate about pot prohibition. Campaign Kickoff Party for Sheri Weiner tonight! TN GOP votes against closed primary elections. Local Campaign Financial Reports to be online! Edu $pending productivity: a novel concept.